He returned to Lucca in 1668: most of his early work is to be found there or in the surrounding area (e.g. Saints Worshipping the Trinity, 1665; Lucca, S Maria dei Servi, and SS Lucy, John the Baptist, Francis Xavier and Others, c. 1670; Montecarlo, S Andrea). In 1674 he established himself in Florence, first under the patronage of the Strozzi family and later under the Medici. The Temple of Love and The Sacrifice (both Florence, Galleria Corsini) were probably painted in that year for the Marchese Pier Francesco Rinuccini and are among his most accomplished works, inspired by Cortona s romantic vision of the ancient world. In 1683 he was admitted to the Accademia del Disegno, and in 1684 he painted various biblical and mythological scenes for Prince Ferdinando de Medici, all untraced except for the Garden of Love (Rome, Palazzo Montecitorio). 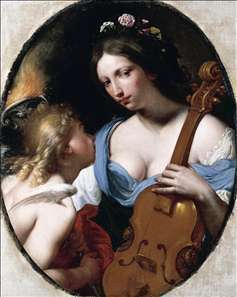 See more details about "Personification of Music (St Cecilia)"